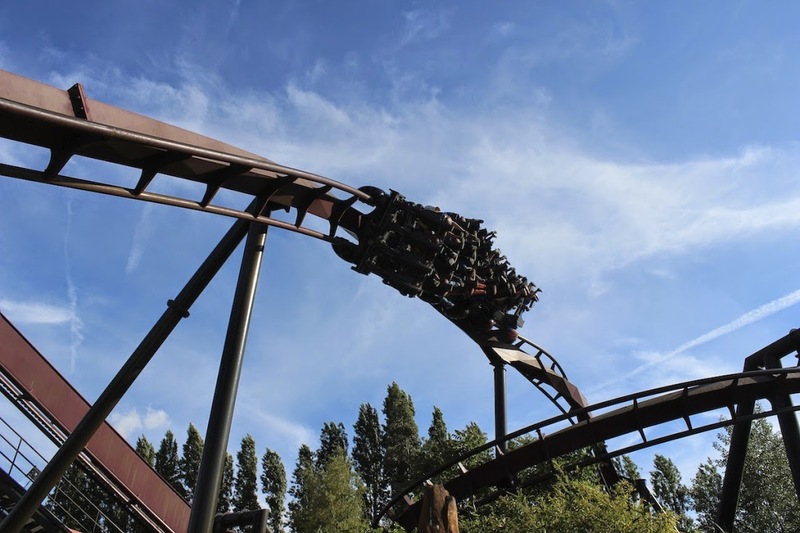 "Spin Into A Sphere of Fear"
Introduced in 2003, Nemesis Inferno is THORPE PARK Resort's Bolliger & Mabillard (B&M) inverted coaster, meaning that for the entire ride your feet are dangling beneath you! Themed around a tropical volcano island, the inverted ride position offers a variety of thrilling forces, foot-chopper elements, and with B&M's pioneering ride technology you can ensure your ride will be glass smooth. 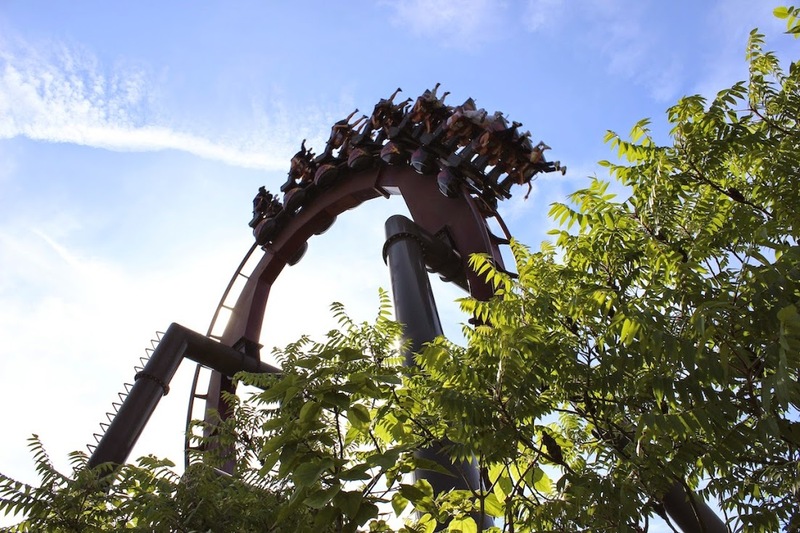 Nemesis Inferno has been found to have matured with age, offering a much more intense ride than during its first few seasons. After guests are securely fastened in their seats, the station's red lights activate and the pulsating bass theme soundtracks the beginning to your ride. 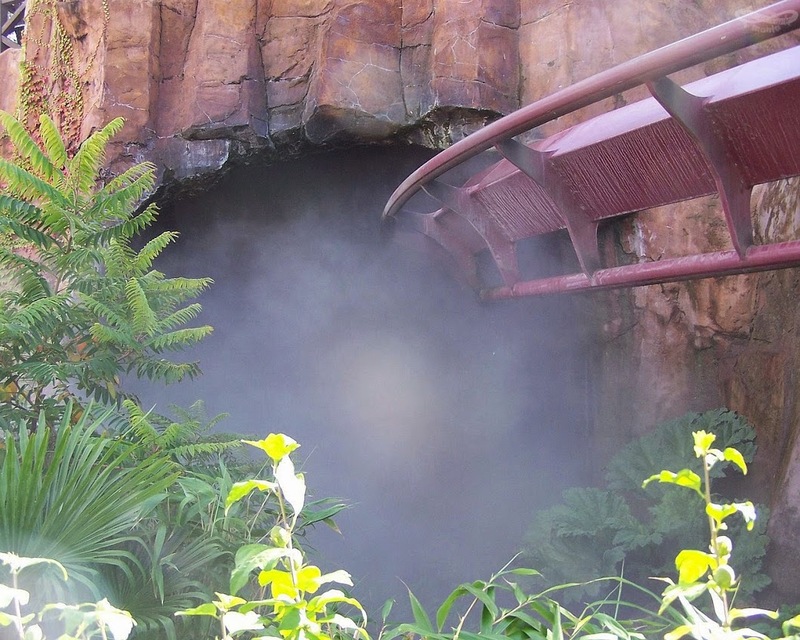 You swing straight into a smoking caldera in the side of the volcano in the pre-lift section and after the climbing to 95ft above the volcanic Calypso Quay, you'll dive down into a vertical loop and straight into a weightless zero-gravity roll. Riders must brace themselves as the train makes a sudden beeline for the tropical undergrowth and pulls riders upwards again and into the first of two interlocking corkscrews. After a hairpin 180 degree turn, the train rolls into the second corkscrew and up a watering gully into the first helix. After floating down into the second, much more forceful final helix, your fiery spin on the resort's red hot coaster comes to an end. Situated at the back of the park, the queue for Inferno can be slower to build up than the rides nearer the entrance, so it could be a good place to start your day if you don�t want to wait long. 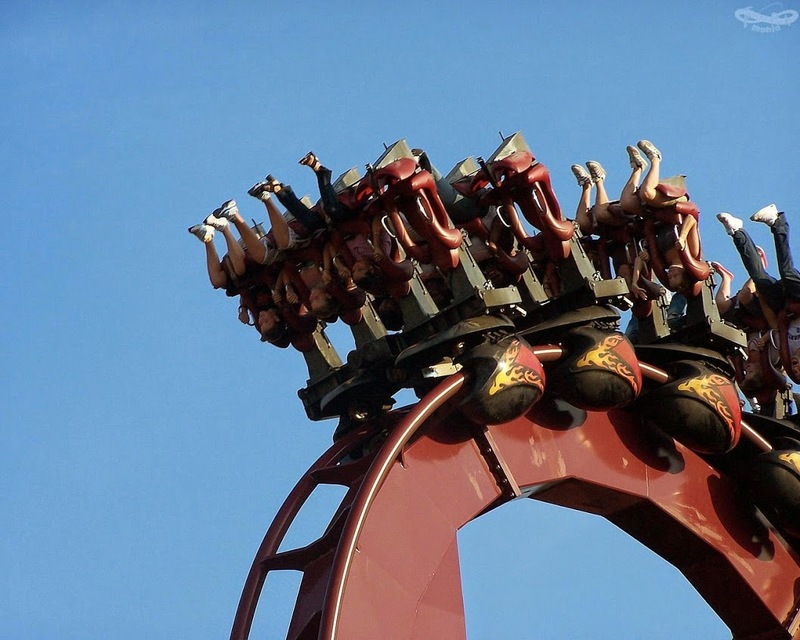 To Ride Nemesis Inferno you must be at least 1.4m tall. People approaching a chest measurement of 51 inches should try the test seat at the entrance or speak with a rides host.